Celebrating American, family-owned apiaries, Bee Raw honeys support artisanal beekeepers and the mission to save endangered bees. Each raw honey vial is hand-corked and wax sealed, then matched with a detailed description of its floral source. Given with four perfect pears for slicing and a detailed card containing delicious cheese pairing recommendations, this sweet gift is memorable and generous. Four 1-Ounce Vials of Raw Honey - Maine Blueberry, North Carolina Sourwood, Washington Buckwheat and Colorado Sweet Yellow Clover. Detailed Card with Honey Tasting Notes and Cheese Pairings. Gift Box Measures 12" x 11" x 4". Honey Flight and Fresh Pears Gift is a hand delivered gift. These gifts are delivered by one of our local design centers located throughout the United States and Canada. Same day delivery is available for most gifts when ordered before the cutoff time. The cutoff time for Honey Flight and Fresh Pears Gift is 2 PM in the recipient's time zone. Bee Raw Varietal Honey FlightFour hand-corked 1 oz. vials are sealed in beeswax and packaged with a beautiful American Oak block, in a ribbon-enclosed gift box. A description of the flavors and origins is also enclosed with your gift. This exclusive tasting of Bee Raw Honey can be compared to wine, tea and coffee in its individuality and complexity. 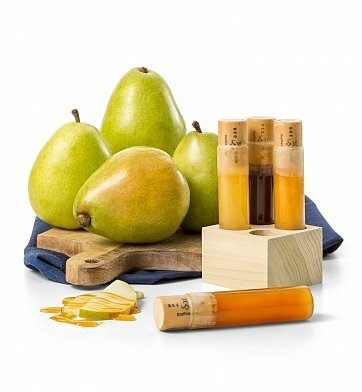 The perfect gift for chefs and food lovers, this collection arrives with four succulent pears for drizzling on the four artisanal varieties of honey. Arrives with four succulent fresh picked pears. Four raw honey varietals in a flight from Bee Raw. Gift box with complimentary card bearing your personal message.